Financial planning can help everyone. It isn’t reserved for the rich, or sophisticated investors, because we all want to make sure we are making the most of our money. Whether it’s making a retirement plan, investing to provide for your children’s education or preparing for retirement, financial planning can help everyone across their lives. A good financial adviser should be a trusted partner who can help you achieve your financial aspirations and protect those you care for through the changing circumstances of your life and potentially in the event of disaster. However, most people don’t really know what financial advisers actually do. 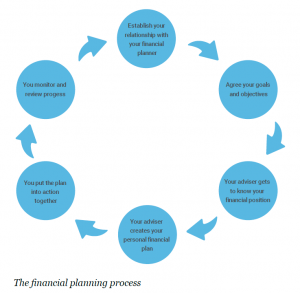 This guide will explain our process in general terms and tell you what financial planning can achieve. Some of the important changes to pensions and investment options in recent years have made the need for financial planning even more crucial. Whatever your reasons for wanting financial advice, it is very important for your adviser to have a thorough understanding of the aims, dreams and issues affecting you and your family. It is generally best to look at your financial affairs across the board, not just around your initial objective. Your personal circumstances now and in the short and longer term may well be affected by these decisions. For example, saving to buy a property could have an effect on your broader financial position, potentially affecting your income and expenditure, and the size of your deposit could impact on your ability to borrow. The purchase of the property could also restrict your disposable income available in the future to meet other objectives, such as paying for your child’s school fees. Or, if money can be found to pay the school fees in the short to medium term, there may be a longer-term impact in other areas. Maybe you will reduce pension investment in the short term, which means you have to invest heavily later to keep your retirement plans on track. 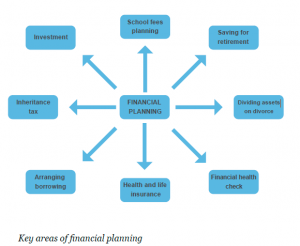 The truth is, it can be hard to deal with one issue in isolation, because most areas of financial planning are interconnected. Focused or relatively limited advice, say on a pension or inheritance tax (IHT) liability, is possible, but a thorough financial review can help you chart your path to your goals. You should expect your financial adviser to ask questions about all your finances, even if you only want to look at one issue. Any financial decision will have consequences that should be planned for and understood. Financial planners follow a simple process. A good planner will use this system to help you achieve your goals. That is the whole process, in simple terms. In some cases, one or more steps might be omitted. For instance, you might simply want a one-off consultation where the adviser does not monitor your position in the future. You can then return to the adviser for another consultation if you need it, months or even years later. However, an annual review of your position is generally advised. As a potential client, you should be asking yourself: do I trust this person and can I work with them? Your adviser will be acting for you, on your behalf, in your best interests. It is important to build a long term, professional relationship where you are comfortable discussing what can be difficult subjects, so that you are happy to put you and your family’s future well- being in their hands. It is worth looking at each of the six steps in more detail, before we consider a particular aspect of planning – the investment process. It is essential for you to be confident and comfortable when dealing with your financial adviser. The chemistry between you and your adviser needs to be right. The first step is to get to know an adviser well enough to decide if you want to take the relationship further. Either in the initial meeting or soon after, this will involve agreeing the broad content and scope of the service, and crucially how much it will all cost. The chemistry will need to be right. Many find the process of giving personal information to an adviser a little daunting and may feel rather exposed. You may even worry the adviser will pass judgement or make you feel uncomfortable about the previous life and financial decisions that you have made. It is important to talk to your adviser and satisfy yourself that you can trust them with this information. We will never intend to make anyone feel uncomfortable, and it is not our place to judge. It is also important to settle the practicalities: does this adviser and the firm have the right expertise and can they provide what you are looking for? The arrangements all have to be set out formally in the firm’s initial disclosure documentation. The form of these documents will vary from firm to firm, but will describe key details such as the service we will provide, the frequency of our contact with you and how long the agreement will last. If your arrangements are complex, agreeing a fixed fee once your requirements have been agreed should save costs spiralling out of control. In any event, you will be given a clear view of our charging structure to discuss. You may be surprised at the amount of information you need to provide to your new adviser. Think about your own financial history. You could have savings, investments, property, mortgages and other loans, wills and other documents, pensions, life and health insurances, income and expenditure, tax and much more. This may be time-consuming to pull together, but it is the essential start of your relationship. Your adviser’s job is to find out what you want to achieve with your money now and in the future. That means gaining a thorough understanding of your views and history on issues such as borrowing, investing, spending (now and in the future), retirement and estate planning. You may not have thought about these issues very much and you might well be encountering some of them for the first time. Many people do not think about their long-term future – at least not in a structured way and not from a financial perspective. There will be specific questions about the level of risk you are prepared and able to take on with your investments. These questions will lead to discussions about how various asset classes have behaved in the past and what they might do in the future. The aim is to build a portfolio of investments that you will be comfortable with, and that will provide the returns you want and need. This step can take some time and we cover the subject in greater detail below. It is important not to rush when answering these questions, but to think about how you might feel in certain situations. Of course, it is fine to contact your adviser for guidance or to ask them questions at this point. Your adviser may ask for a surprising amount of paperwork and information, but it is important to make sure they have everything they need before they begin to analyse your situation and formulate a plan. The next step is for the adviser to make sense of all this information, then come up with preliminary conclusions and initial ideas for your financial plan. Your adviser will complete exercises such as drawing up a balance sheet of your assets and liabilities, making a breakdown of your current income and expenditure, and calculating your tax liabilities on income, potential capital gains tax (CGT) and IHT. An important aim of the analysis is to identify potential financial gaps or shortfalls in your future. These could be gaps between your income and expenditure now and in the future, shortfalls in your pension or insurance provision, or other areas where you need to take some action now to bridge the gap between your goals and your current outcomes. One of the most powerful tools they will use is long-term cash flow modelling. This planning technique is designed to project your future income and expenditure throughout the whole of your lifetime. Obviously, it includes guesses about your future circumstances, but it should be based on reasonable assumptions about things such as your income, and how your pension and other investments may perform. By its nature it cannot be a precise forecast, but it can clearly demonstrate financial gaps, especially whether – and when – you are likely to run out of money in retirement. Cash flow modelling might reveal things you will need to change about your lifestyle. You might need to revise your goals and aspirations, or you might also need to adjust some of your current patterns of behaviour, such as spending and saving. It is very important to be clear about your priorities – what might have seemed to be a high priority at the start of the process might have to be replaced by another need as the analysis continues. Once your needs and wants have been identified, analysed and quantified, it is time for the adviser to do some specific product research into funds, tax-wrappers (such as ISAs) and insurance products. You should be prepared to make decisions about what is most important to you. A thorough analysis of your finances may reveal you can’t afford all of your goals, and that you have to prioritise which outcomes are most important. After all this preparation, we get to the formulation of the detailed plan itself. This will contain both the broad strategy and the specific solutions your adviser recommends. The suitability report is a key document setting out your objectives, financial gaps, the recommended strategies and specific solutions. The report should be as easy to read as possible, but there may be a lot to cover and some of it will inevitably have technical or unfamiliar elements. It is a good idea to meet your adviser face-to-face and spend time going over the report to make sure you understand everything and that it meets your agreed needs and aims. You should also be happy that the recommendations are suitable for you. Your adviser can make adjustments to the report in the light of these in-depth discussions, so the plan is not a fixed document. The most important outcome at this stage is to decide which recommendations you would like to go ahead with. Now you have a clear plan and set of actions, you can start working on implementing it. It is vital that you understand what is needed on your part and that of the adviser, to ensure your objectives can be met. If you are at all unclear or uncertain, it is important to ask. We often see that clients who are not clear about why a certain action is being taken tend not to take that action, and that the overall plan then fails to meet their needs. Financial advisers can generally execute any purchases and sales required under a plan on your behalf, as well as recommending a suitable portfolio of investments. Advisers do also sometimes work with other professionals such as lawyers and accountants, who can provide specialist legal and tax advice and help with the implementation of certain aspects of your plan. Carrying out the agreed recommendations is usually the most straightforward aspect of the planning process, but it can be time-consuming. Pensions need setting up, funds selling and buying, insurances arranging and trusts settling. It is up to you whether you put your plan into action or if you ask your adviser, or another professional, to act on your behalf. You will probably want your adviser to keep an eye on your investments and other financial arrangements. We will agree the extent of monitoring and review you wish to be carried out with you. For example, you could receive valuations on a quarterly basis, or perhaps more frequently, or you could attend meetings or have phone calls on a regular basis or on a more ad hoc basis. In any event, you should have some form of meeting with your adviser once or twice a year. Your review offers you a chance to catch up with what has changed – either in your own circumstances or in the financial world generally – and discuss things with your adviser. Much of the groundwork has already been done, so the review is likely to be shorter and easier to carry out than the initial advice. However, this might not be the case if there have been significant changes in your circumstances, like a marriage, divorce or a substantial inheritance. The process for choosing investments is a key part of financial planning and it has its own specific requirements. A key element of financial planning is for your adviser to understand your aims and attitudes. You might be looking for income, growth or a combination of the two. What’s more, you might be looking to achieve a specific target level of capital at a future point in time. Risk capacity – how much risk you can objectively afford to Some people have substantial wealth, so they can wait for a long time before they need access to their investments or they may not be dependent on their investments. If you are in this position you can normally afford to take more risk than people who have less wealth, need immediate access to their savings or are highly dependent on income or capital. Risk tolerance – how much risk you are psychologically willing to Some people are comfortable with investments fluctuating, while others find it more difficult. One way to gain insight into your attitude to risk is to use a psychometric questionnaire. Financial advisers can follow up the issues with an in-depth discussion of what your answers tell you. Risk need – the amount of risk you need to take, based on the assumptions previously agreed, in order to achieve your stated This amount of risk may be more or less than you are comfortable with, but it shows you clearly what risk you would need to take. If you are uncomfortable taking on that amount of risk, amendments can be made. You would need to re-think your objectives and the amount of money you are willing to invest towards them by reducing your expenditure. There are lots of options and your adviser will discuss them all with you before putting any plan into action. Asset allocation is by far the biggest factor for a portfolio’s risk and return. How you choose to split your investments between the main asset classes – shares, cash, bonds and property – will depend on your risk profile and your aims. Broadly speaking, the more risk deemed appropriate as set out in your plan, the higher the proportion of the portfolio should be allocated to shares. It is then a question of choosing the right funds within the asset allocation, which could be undertaken in-house or it could be outsourced to a specialist fund manager. You should also consider if you want to invest in ethical or socially responsible funds, and whether the funds should be held in a particular tax wrapper such as a pension, ISA, or life assurance bond. By diversifying your investments across different asset types, you can generally provide a more stable return. You could achieve better results by focusing on shares and funds, but this is a riskier choice as the value of your investments could drop as well. In theory, you can do everything a financial adviser does yourself. Successful do-it-yourself financial planning is feasible, if you have the knowledge, time, patience and self-discipline. How will you quantify and qualify your objectives? Have you written down exactly what you are trying to achieve and over what timescale, for example retiring at age 65 on an income of £20,000 per annum, net of tax. Have you established how much risk you are prepared to take? You should assign a percentage of assets you need to keep in cash and short-dated investments (for shorter-term objectives), as well as a percentage that you are prepared to put at calculated risk on equity markets. Have you identified how much you have available to invest towards this goal? You might have a lump sum of £10,000, or a monthly investment of £100 per month. How will you assess your existing investments that you intend to use for this objective? Which are the best wrappers for tax efficiency? Should you invest in pensions, ISAs or something else? Do you know when you will review your actions taken and results achieved? You should undertake a review regularly and have the discipline to rebalance your investments back to your original split of cash and equities to ensure the risk you are taking does not increase. The value of your investments can go down as well as up and you may not get back the full amount you invested. Past performance is not a reliable indicator of future performance. Investment in a registered pension fund is subject to many restrictions on access and how the funds can be used. There are lots of good reasons why you probably won’t want to conduct your own financial planning, even if you feel theoretically able. It is, after all, a time-consuming process. There is a lot to learn and then keep up-to-date with. The legislation about tax and pensions is complicated and constantly changing. Investments, investment products and markets are constantly changing, meaning you would have to make critical decisions on your own and implement them. You may also find it hard to make such big decisions alone. Financial advisers are equipped with the know- how to undertake their own financial planning, but even they use colleagues to help them make sensible, objective decisions. As we’ve outlined in this guide, we’re here to help you through the stages of financial planning so that you and your family can make the most of your finances. This publication is for general information only and is not intended to be advice to any specific person. You are recommended to seek competent professional advice before taking or refraining from taking any action on the basis of the contents of this publication. The Financial Conduct Authority does not regulate tax advice, so it is outside the investment protection rules of the Financial Services and Markets Act and the Financial Services Compensation Scheme. This publication represents our understanding of law and HM Revenue & Customs practice as at 1 January 2019.